Great Hostel! Very nice facilities, the staff is super friendly and you are waking distance from Casco Viejo which has A LOT of bars !! If you arrive at night it the area may look a little scary but it is only the first impression. It is very quiet inside and you can have a nice sleep despite you are in a hostel. Very nice and helpful staff. Nice atmosphere. Clean rooms and bathrooms. Short walk from train station and city attractions. Great staff! I really enjoyed my staying:) See you soon Bilbao ! Very clean and nice hostel but in a VERY sketchy area of town, especially if you are a solo female and you have to walk home alone at night! During the day they neighborhood isn't bad. Solid value. It was difficult to meet people at the hostel however because there were no events. But good location and cheaper than other hostels in the area. 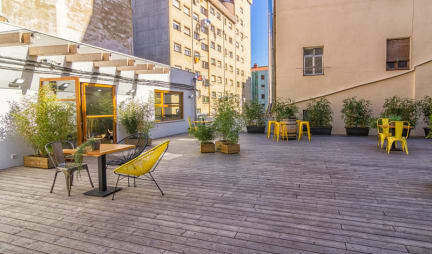 Clean, modern hostel with helpful staff and lovely terrace. However the location was a massive drawback as the area felt unsafe - the hostel itself was very secure but walking to and from was bait. Also kitchen facilities were very limited. Didn't feel safe as a solo traveller, "kitchen" facilities were actually a microwave and hotplate, bathrooms weren't well designed. As detailed in other reviews this hostel is not in a good area, but is within easy walking distance to the old town and public transportation. Other than the price point I booked the hostel at (which was the cheapest at the time) there isn’t a reason to stay here especially when considering that there is plenty of accomodation located in a safer environment closer to things to do and places to eat/drink. Bcool did not have an atmosphere and there is nothing notable about the staff.